SAP Fiori is essentially the new interface for SAP and when designing any Fiori based apps they should be Role-based, responsive, Simple (1-1-3) and coherent. The 1-1-3 analogy refers to the screen design which should be for 1 process, 1 user and no more than 3 screens down(or 3 clicks). 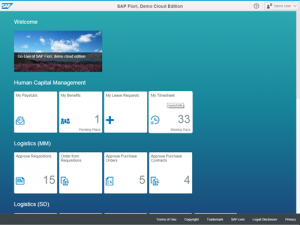 Fiori web plus – Available via the app store and play store integrates the Fiori client. For improved caching and security.